In your home and neighborhood lessons, often the very best option for optimal results.. Classes are small and friendly. Group clicker dog training obedience classes are taught in several locations.. Dog training obedience group classes presently take place in Briarcliff Manor, Westchester. Carmel in Putnam County. No group classes are offered in CT, but Carmel, NY is nearby. Check back to see when group classes in Dutchess county might be offered. Dog Training group obedience classes are a fun way to learn how to train your own dog, with the added advantage of built-in socialization with other dogs and their owners. Puppies are ready to join a group when they have completed their Distemper vaccine program, usually at around 3 months of age. Commands taught are sit, down, stand, stay, loose-leash walking, heel with automatic sit, come with automatic sit, the finish, and leave-it. Normal young dog problems such as jumping, nipping and stealing are covered. All graduates of group classes can receive a photo of your dog or pup, suitable for framing, wearing a graduation cap, dated, with dog's name and level of accomplishment. Beginner and Intermediate group classes are offered in Westchester & Putnam County. In Intermediate class, we move toward an off-leash goal, with more advanced obedience. Fun Agility trainining, Rally O and Tricks are all part of Intermediate classes. 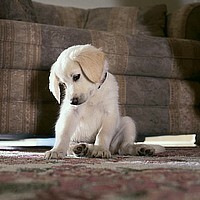 Having trouble house training your puppy or dog? Linda can help. Your in-home consultation will consist of both verbal and written in-depth instructions, tailored for your particular needs. Choosing a dog is an important decision. Linda can help you decide which breed is right for your lifestyle and family. Perhaps you are interested in adopting a dog, but would like some advice on the dog's suitability and/or temperament prior to making a commitment to a particular dog. Expert and realistic guidance can take the stress out of adding a new pet to your family. Training dogs for children with developmental disabilities and psychiatric service dogs for people with social phobia and panic disorders. Many problems and questions can be handled over the phone. This is the most inexpensive way to get the help you need. Call Linda to schedule your phone consultation. I handle nationwide calls. 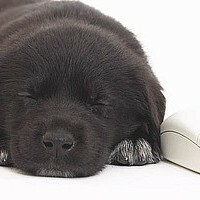 Keep on clicking, clicker training is the fastest way to train dogs and all animals. Used in Zoos, Marine Mammal Shows, & Service Dog Training by the Delta Society. Clicker training is user friendly, effective, and fun for your whole family. Group classes are small and friendly. Groups are a fun way to learn to train your own dog, while providing important socialization with other dogs and their owners. Beginner and Intermediate classes are offfered. See the calendar section for times, dates and locations. Commands taught are sit, down, stand, stay, loose-leash walking, heel with automatic sit, come with automatic sit, finish, leave-it. Normal young dog problems such as nipping, jumping, and stealing are covered. Can't decide what breed of dog is right for you and your family? Want to rescue a dog but feel you need some advice on suitablity? Do a consultation with Linda. She can advise you on a dog to suit your lifestlyle and requirements. Do you have an otherwise perfect dog or puppy, but are having trouble with the housebreaking process? Linda can help. She will provide you with written instructions, tailored for your situation, to help you get the job done.